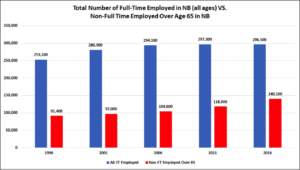 A shrinking labour force and a rapidly growing population of non-employed seniors in relation to active full-time workers represents an enormous challenge to New Brunswick over the next three decades. The demographic trajectory of New Brunswick has been creeping up over time. For instance, for every 100 working-age people, there were 15 seniors in 1971 and 21 in 2006. But that trend line is accelerating upward. By 2056, it is projected that there will be 50 seniors for every 100 workers. There are two worrisome trends for the health and solvency of New Brunswick. The first is stagnation in the number of full-time workers; they are most likely to pay income taxes and more in sales taxes. In 1996, just over 253,000 New Brunswickers worked full-time. This figure grew to 280,900 by 2001. Then full-time workforce growth slowed greatly, rising to 294,100 in 2006 and 297,300 in 2011. Between 2011 and 2016 the number of New Brunswickers working full-time declined to 296,500. 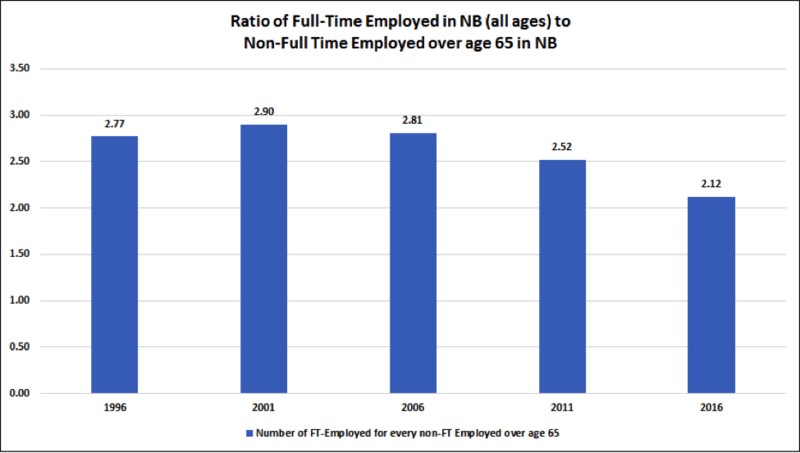 The second worrying trend is the accelerating number of New Brunswickers over age 65 who aren’t working full-time; they are most likely to consume healthcare resources, which absorbs nearly a third of the provincial budget. For a province already over-taxed, and severely indebted, these trends demand a serious rethinking of social program provision and spending. What matters in examining the two trends is the ratio between those working full-time and those over 65 who are not working: there are less and less full-time workers than there are non-full time working seniors. In 1996, there were 2.77 full-time workers for every non-full time working senior in the province. This ratio improved by 2001, rising to 2.9-to-1, and held at 2.81-to-1 in 2006. Yet, beginning in the mid-2000s it begins to dip, so that by 2011 the ratio was 2.52 full-time workers to every non-full time senior. In 2016, the most recent census year, it declined further, down to 2.12-to-1. The rapid change in that relationship unfolds even though full-time employment among seniors is increasing, from only 1,800, or less than 2 percent of seniors, in 1996, to 8,700, or just under six percent of seniors, in 2016. Anticipated demographic and labour force trends will not likely reverse this phenomenon. Rather, the rapid increase in New Brunswick’s elderly population will intensify. Roughly one-sixth of the population will pass into the senior category over the next decade. As of 2016, there were 120,000 New Brunswickers age 55 to 64. By comparison, in the same year there were 78,500 age 10 to 19, who would enter working age over the next decade. In addition, as Richard Saillant points out in his book Over The Cliff?, the prospects for renewed strong growth of the province’s labour force are slim. There are serious implications to this crunch in active full-time population. For example, take healthcare costs. While all use healthcare, the degree of use and its cost rises massively as we age. As Saillant also points out, as of 2011, New Brunswick spent about $4,100 per capita on healthcare. However, among those age 75-79, the per capita figure rises to $12,400, and it jumps to $28,600 for those over 90. An aging population drives up public healthcare costs, though Saillant recognizes that other factors such as compensation growth are an even bigger driver of provincial healthcare costs. In all, healthcare spending per capita in New Brunswick is projected to more than double to $10,000 by 2036. For a province already facing large debt, low productivity, and some of the highest tax rates in North America, the two trend lines ought to provoke honest public policy conversations. Increased immigration can be a remedial mitigating element, but there are no silver bullet solutions. After all, immigrants also age and the level of immigration needed to offset the rapid aging of New Brunswick’s population is probably unrealistic to achieve, particularly if they can expect a tax-heavy and entrepreneur-discouraging environment. Ultimately, the province’s spending needs to be addressed. New Brunswick needs to have a massive rethink about public spending. With drugs and the rise of more mobile forms of healthcare, New Brunswickers might rethink their commitment to over twenty bricks-and-mortar hospitals that consume 45 percent of the healthcare budget. This is only one area among many where disruptive, yet-necessary market solutions will need to be implemented.